Transportation Action Plan Update Underway - Minneapolis Riverfront News - Minneapolis Riverfront Neighborhoods. Good planning leads to successful outcomes. 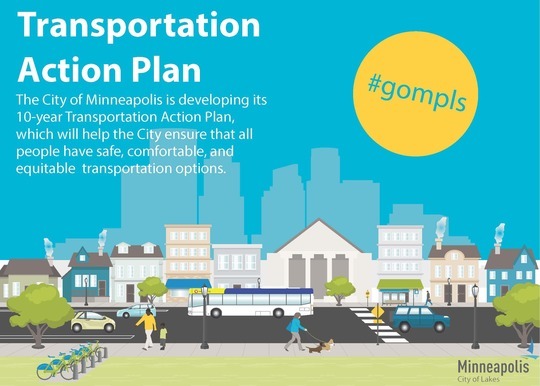 The Transportation Action Plan will update and build off Access Minneapolis, the City's existing transportation policy plan. We've accomplished much of what was outlined in Access over the last 10 years. Significant investment in the City’s bikeway network, resulting in substantial decreases in the bicycle crash rate and bicycle crashes with serious injuries. Throughout the next year, the Public Works will conduct extensive community engagement to hear your ideas on how we should improve our transportation network. Information regarding future outreach events will be outlined on the Transportation Action Plan website. Public Works will seek City Council approval on the Transportation Action Plan in fall 2019. Minneapolis 2040: What is next? The public comment period closed on July 22. Staff are reviewing comments which will inform changes to a revised draft plan that will be released in late September. The revised draft will be taken under consideration by the City Planning Commission in late October and the full City Council in December. The approval process will include a formal public hearing at which anyone can submit written comment or speak in person. Specific dates and times will be announced later this summer. To view public comments that have been received visit the Minneapolis 2040 website. Comments received by email and meetings will be posted at a later date.